Um, What's This Weird Hunk of Metal We Just Found on Mars? ... Really, what is it? Mars is, on the one hand, a source of unending fascination. It is, after all, Mars. And we're exploring it with, you know, a nuclear-powered robot that leaves Morse code in its tracks. But Mars, on the other hand -- and no offense to it or to said robot -- is also a source of unending ... unendingness. It is dusty and hilly and rocky and red, mile after mile. Lather, rinse, repeat. And now we have another Martian Mystery Object -- this one a thing that looks suspiciously like a hunk of metal. Curiosity detected it, through a high-res image taken from its Mastcam, on Sol 173 (January 30 in Earth days). Universe Today calls the object "a small metallic-looking protuberance" -- it resembles a thick, bent nail, sticking out of the Martian surface -- and it is visible in part because it projects a tiny little shadow on the rock below. So ... what is it? It could be iron -- perhaps from a meteorite, Planetsave speculates. (The iron seems not to be oxidized, which would track with the low levels of oxygen present in the Martian atmosphere.) The object could also be something that has "grown" on the rock below it, says Universe Today. The fact that it doesn't seem to be covered in dust, however -- the thing, per this photo, is shiny -- would give further credence to the metal theory, since metallic surfaces tend to resist dust more easily than other materials do. Or maybe it's just a misleadingly lit photo. At this point, we just don't know. That's the magic and the frustration of exploring another planet from here on Earth, of making Mars a place that is close to and far from us at the same time: Our evidence itself can be mysterious. Our data are, often literally, rocky. NASA and JPL and their roving little robot will try their best, ostensibly, to figure out what that apparent hunk of metal is. 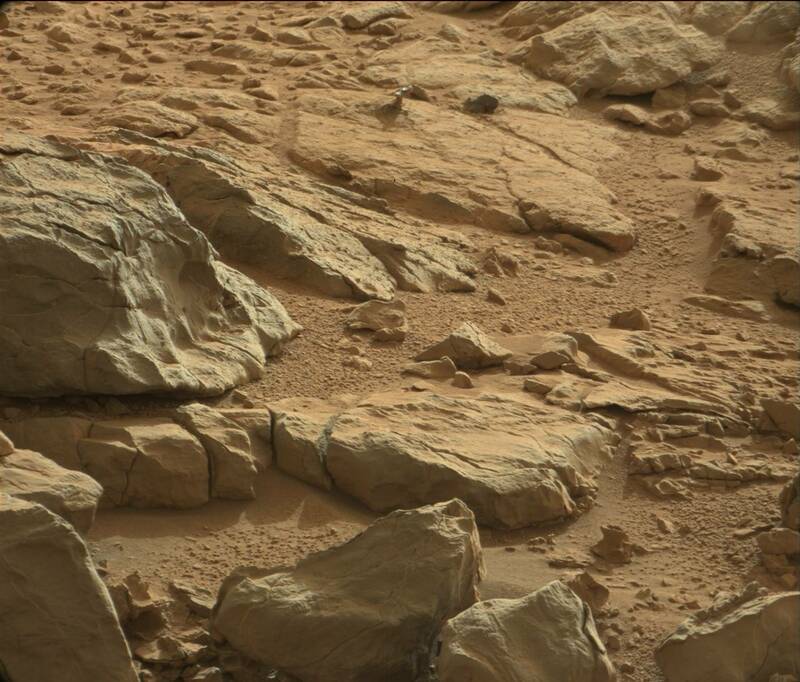 In the meantime, though, we'll all have to be satisfied with a little Martian mystery.